Enjoying the fame of “Aesculapius”, Hua Tuo (145 – 208A.D.) is a famous highly-skilled doctor of the Eastern Han Dynasty in China. He was born in a common Shizu family in the late Eastern Han Period and lived in the same period with another renowned doctor Zhang Zhongjing. Based on his rich experience in medical treatment, Hua Tuo compiled a medical book, which was regrettably not handed down. The existing Zhongzang Classic by Hua Tuo was compiled by people in the Song Dynasty, probably containing partial content of Hua Tuo’s book remaining at that time. Therapies and body-building methods created by Hua Tuo are of great significance as a milestone in Chinese medical history. They include the method of externally extruding heart, mouth-To-mouth artificial respiration, anesthesia method —alcohol-auxiliary powder for anesthesia, and the body-building Five Mimic-Animal Exercise. Moreover, surgical operation originated by him was canonized by later generations. The legend of Hua Tuo’s curing Guan Yu by cutting bone can be found in Romance of the Three Kingdoms. Hua Tuo was hereby respectfully called “Originator of Surgery” by later generations. Other than systematically accepting ancient experience in medical treatment, Hua Tuo gave top priority to the application of folk experience in this regard. He traveled to numerous places, collecting herbal medicine and learning medicine-related knowledge from local people. Meanwhile, he collected from common people large quantities of prescriptions which were later frequently applied by him to treat diseases. There still exist Hua Tuo Memorialized Grave in Xuzhou, Jiangsu Province and Huazu Temple in Peixian County, which were built by people to commemorate Hua Tuo. In the opinion of contemporary western scholars, Hua Tuo is an outstanding representative of oriental medicine in ancient times and can be on a par with Hippocrates, the father of western medicine. Shennong is one of the legendary ancestors of the Chinese nation. He’s also known as the Yan Emperor of the Three Emperors and Five Sovereigns in ancient China. He is believed to have taught people how to identify different kinds of plants and how to grow crops so as to survive and bring up children. The beautiful legend of Shennong tasting hundreds of herbs shows that Shennong discovered Chinese medicine. It is said that in order to relieve people of afflictions and sufferings, Shennong decided to taste all plants to find out herbs with medicinal effects and capable of curing diseases. After going through all kinds of hardships and difficulties, Shennong tasted all herbs and ended up transmogrified into a spiritual form of immortality from poisonous herbs. He sacrificed his own life in the final act that saw his spirit become immortal though Shennong’s physical form died. To commemorate him, people honored him as “Medicine Saint”. This was among tje more famous of early attempts at immortality from alchemy and cinnabar. For thousands of years, Shennong’s great spirit of “benefiting and rescuing people” have been highly respected and praised. It was this very spirit that spurred a lot of great physicians and pharmacologists of later ages like Bian Que, Li Shizhen and Sun Simiao to make unremitting efforts to carry on the great tradition of “saving the people and serving the society” in Chinese medicine, bringing it to a great height of development. Ge Hong was a noted Chinese physician lived between 284 and 364 AD. He had a sobriquet of “Baopuzi” (The Master Who Embraces Simplicity), so his best known work was also called Baopuzi. Ge Hong was said to be a Taoist immortal, who lived to a great age. In fact, Ge Hong was a historical figure in real life. He was not just a Taoist theorist, but more of a renowned alchemist. According to his work Baopuzi, he did lots of chemical experiments in his lifetime£¬including the experiment to obtain arsenic using the three substances of realgar, rosin and niter. The book also recorded his making of mercury ointment for scab and other diseases by using lard as the bodying agent, while similar therapies were nonexistent in European medicine until the 10th century. Ge Hong’s alchemy received a lot of attention from academia of home and abroad, with some of his works being translated into English and French and gaining popularity across the world. Zhang Zhongjing is the most famous of China’s ancient herbal doctors. He is known for his book, which was later divided into two parts: Shang Han Lun and Chin Kuei Yao Lueh [Jin Gui Yao Lue]. In particular, the section known as the Shang Han Lun became the fundamental text for all traditional herb prescribing. Not only did it contain over 100 effective formulas (many of them still used today), but the text implied a theoretical framework that led to hundreds of books analyzing, explaining, and reforming it. The other section is best known for some of the formulas, such as the gynecological remedy Tang-kuei and Peony Formula [Danggui Shaoyao San] which is today applied to infertility, disorders during pregnancy, prevention of miscarriage, and post-partum weakness. His work might have been lost had it not been for the efforts of Wang Shu-Ho. Ye Tianshi (1667-1746) was a famous physician of the Qing Dynasty from Wuxian County of Jiangsu Province. Under the influences of his grandfather Zifan and father Yangsheng, both of whom had a masterful command of medicine, Ye Tianshi accumulated a wealth of medical knowledge and became a renowned physician. As a child, Ye Tianshi was fond of learning and studied under 17 teachers in various times. He made flexible use of ancient medical theories and experiences in his diagnosing processes, which involved his original insights. Later, he composed the book of Treatise on Epidemic Fevers by drawing on the strengths of different doctors. The work contributed a great deal to the study of epidemic febrile diseases. But Ye didn’t write many books in his lifetime. His disciples compiled some books based on his experiences, including A Guide to Clinical Practice with Medical Records and The Collection of Dr. Ye’s Medical Records etc. There are lots of legends about Ye’s modest learning and flexible diagnosis circulating among the people. There was no reference if this Celestial of the “Templi Ordo Literatum’ (Order of Letters) based in the Wen Temple of Suzhou, managed to obtain immortality. Smallpox vaccination is the way to prevent the disease initiated in ancient China. Smallpox was called “vaccinatable boil” in China at that time, hence the name of the prevention measure—”boil vaccination”, which is done by slightly infecting someone with the disease. The person will then get immunity against smallpox after slightly suffering from it and they’ll never contract the disease again. Originally, people were afraid of contracting smallpox, but they later deliberately get it for the purpose of vaccination. That was a great change, which was brought about by the experiences accumulated in the process of combating the disease. Chinese smallpox vaccination began to be introduced overseas in the early 17th century. First in 1688, Russia asked to send doctors to learn the skill. Later, Korea, Japan and other countries all followed suit. In addition to chi (qi), traditional Chinese medicine recognizes a subtle energy system by which chi (qi) is circulated through the body. This transportation system is referred to as the channels or meridians. 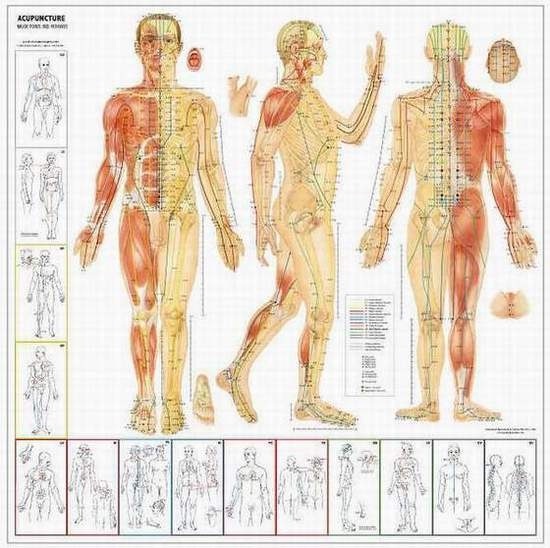 There are twelve main meridians in the body, six yin and six yang, and each relates to one of the Zangfu, or organs. The same is true in relation to chi (qi) and the meridians. When chi (qi) is blocked, the rest of the body that was being nourished by the continuous flow, now suffers. Illness and disease can result if the flow is not restored.